International Relations in the 21st Century: What Does a Fair Deal look Like and is it Possible in Today's Interest-Driven Global Reality? Several recent facts raise the question of the evolution of Africa in the global market. The recent adhesion of South Africa to the BRICS is perhaps a chance of a new cooperation between these five countries. While the director of the MIF resigned from his position, we can see the ambition of Africa to take such an opportunity of a possible leadership. It is important to think about the way to establish a fair partnership with international institutions that benefits for both sides of the world. Moreover, we witness in Africa a growing implementation of the Asian Tiger: China is now their second economic partner. While some claim it is a threat, others say that the European or American interests in Africa represent a bigger risk. In addition to the questions of Aid vs. Trade, it is necessary to ask ourselves about a fair arrangement between Africa and other parts of the world, to reduce the development disparities. A Partnership with International Financial Institutions: Is it Profitable for Both African and Western Countries? The Implantation of China in Africa: A Windfall or a Threat? Will the Recent Adhesion of South Africa to the BRICS show significant results regarding Integration in the Global Economy? Are Economical Aid Initiatives Strong Enough to Bring About a Significant Change? Multinational Firms Implanted in Africa: Opportunity or Disaster for the Development? Should the Debt of Africa Really Maintained? Cultural Diplomacy: Restoring Excellence to Africa's Values and Traditions –From Leadership to Traditional Knowledge Systems. One of the main peculiarities of Africa is still the low level of urbanization. Despite the growth of urbanization from 14% to 32% during the 1950s to late 1980s, this process began to reverse in the 1990s. One of the traditions most under threat is the typical extended family. These peculiarities are far from the concepts of the mononuclear family, urbanization, and indirect democracy which have been identified by political scientists and economists as the main determinants of the transaction of the West into a modern society. Given this, is it possible to pursue an African construct of development? Western Education and African Development: Impairing or Misguidance? The Role of Culture: Can the Rural Traditions Survive in an Urban Environment? In light of the current crises that have swept North Africa and Cote' d'Ivoire, creating not only national but also regional instability, do African leaders and institutions have the will and the means to enact principled resolutions? Questions remain over whether the African Union and its tools, such as the African Peer Review Mechanism, are effective enough means to monitor and dissuade intra-state conflict. The debate still exists between Africa's wish to exercise continental self-determination in its affairs, but its ability to act when an international crisis arises, without the help of global actors. Tied into this is also the role of regional actors, such as South Africa, Nigeria, and Egypt whose own instability raises into question their ability to lead. Democracy and Stability: Can We Create Peace and Promote Democracy at the Same Time? The States of Africa, both internally and collectively, endure a number of challenges that need to be addressed, tackled with clear strategies, and implemented. In order for Africa to develop, action needs to be taken, and while these issues are not new, fresh initiatives, programs, and ideas will be presented and debated. These issues characterize the very real future for Africa, encompassing the most urgent aspects in need of reform across the political, economic, and cultural spheres. 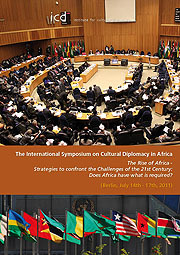 In discussing the central theme of the Symposium – Will Africa Have What it Takes to Confront the Challenges of the 21st Century? - it is impossible to answer that question without first considering if African countries have what it takes to confront their own challenges which currently exist. African Leaders now have to balance the interests of so many different groups in society presenting equally valid and urgent needs, whilst attempting to retain some notion of national unity. Beyond this, they must also consider promoting interest with international investment, neighborhood relations, and global priorities. What should be the order of priorities for the next generation of African leaders, and how do they pacify the plethora of needs from the people they represent?